Attorney Gregory Brod is a personal injury lawyer who serves as a fire injury lawyer in San Francisco and throughout the Bay Area. Along with his legal team, he works with people injured by fires caused by someone else’s negligence or wrongdoing from fires started by faulty products, fires intentionally set by arsonists, and fires caused/exacerbated by a landlord’s failure to maintain a safe living environment. As we discuss in today’s post, there are a wide range of injuries caused by fires and our team is ready and able to help people facing all forms of residential fire injuries in Northern California. Last weekend, as reported by ABC7, a three-alarm fire in San Francisco left 16 people without a home and injured one child. Firefighters were called to the North Panhandle building around 8:30 PM on Saturday. An assistant fire chief told reporters that Muni and power lines complicated the fire fight but they were able to contain the blaze in about an hour. A child was cut by glass during the blaze. What precisely causes fire injuries and what types of injuries are commonly seen as a result of house fires? A report titled Civilian Fire Injuries in Residential Buildings 2011-2013, issued in August 2015, the U.S. Fire Administration (“USFA”) looks specifically at these issues. In broad terms, the report found 80% of residential fire injuries are caused by “exposure to fire products” (e.g., flames, smoke, heat). Following that large category, 8% of reported home fire injuries resulted from “exposure to toxic fumes other than smoke” and 4% due to miscellaneous other causes including jumps and structural collapse. The most commonly reported injury types in residential fires from 2011 to 2013 were smoke inhalation (accounting for 42% of reported injuries) and thermal burns (24%; does not include chemical burns, electrical burns, or scalds). 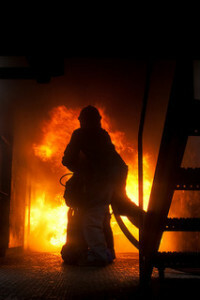 Thermal burns result from contact with flames, hot surfaces/liquids, and other heat sources. The thermal burns most commonly involved the upper (58% of thermal burns) or lower (15%) extremities. Smoke inhalation injuries may not always be apparent immediately after a fire and can take a day or two to become evident. Moving to other injury categories, burns in conjunction with smoke inhalation accounted for 13% of reported residential home fires. Less frequently reported injuries, but still injuries one can expect to see from some fires, included breathing difficulties (6%), scalds (4%), and cuts/lacerations (3%).